When I was earning my Ph.D. at Ohio University, communication guru Marshall McLuhan spoke to a campus auditorium jammed with students. McLuhan had garnered a reputation as a true communication guru. So I was delighted to see one of my fellow communication colleagues–Pat Rocchi–feature McLuhan in his blog. 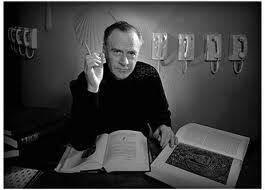 With Pat’s permission, I am sharing his tribute to McLuhan with you. One of McLuhan’s prime principles was that “we shape our tools, and thereafter our tools shape us.” Can we doubt that statement today, given how we interact through Web 2.0? We make “friends” through Facebook, we reveal our innermost thoughts through our blogs, we make spectacles of ourselves through YouTube, and we have learned to communicate succinctly in just 140 characters through our Twitter accounts. Once again, we are currently reminded of the power of the media in our politics. And I do not mean our primary Presidential politics. No, the “global village” that McLuhan foresaw also has global politics. Time scoffed yet again when McLuhan stated in Understanding Media that “Had TV occurred on a large scale during Hitler’s reign, he would have vanished quickly.” No, the Old Professor was on target, as we have seen Twitter and Facebook cut through censorship and propaganda to produce an Arab Spring or rally for the rights of the disenfranchised. And here in this country, presidential front runners fall back almost immediately as they wilt under the glare of the media spotlight. That durability under scrutiny seems to determine winners more than any other obstacle. Some partisans may complain that Barrack Obama did not face any real scrutiny during his primary campaign, but come on; I was viewing fresh footage of his pastor, the incendiary Rev. Jeremiah Wright, every morning, whether through the network news or the Internet. And will Mitt Romney, seemingly made of asbestos and impervious to the heat of battle, win his party’s nomination because no medium will be able to lay a finger on him long enough to count him out as they have so many others? We’ll see. The global village did not exist when Marshall McLuhan coined the phrase. But somehow he emerged from his intellectual rabbit hole to glimpse it, and then he wrote many books and essays to prepare us for it. Let’s stay aware of the power we possess through our media, which have indeed become our extensions and have united us (and conformed us) in ways that only he seemed to imagine. Pat Rocchi and I will welcome your response. Go to the end of the blog entry in the section below and click NO COMMENTS if none have been made, or if comments have been made click 1 comment, 2 comments, or whatever the comments button says. The comments section will appear.